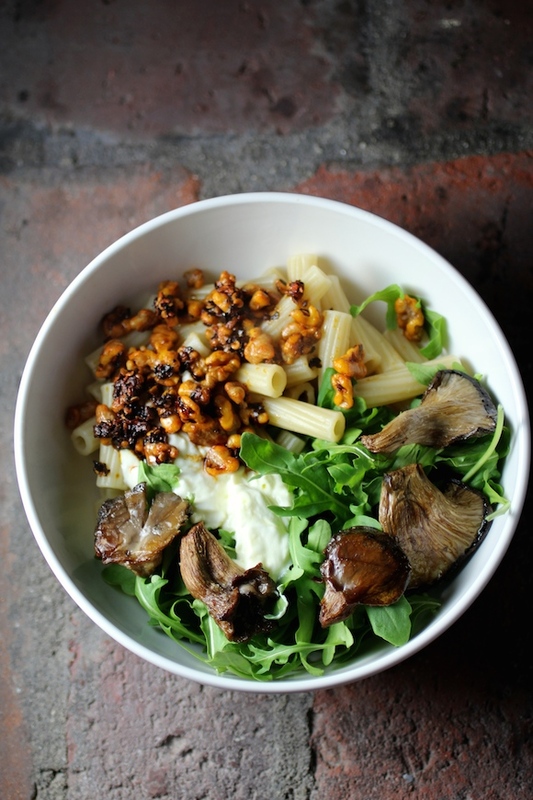 While Chef Yotam Ottolenghi makes his with conchiglie, peas, pine nuts, and basil – my dish with rigatoni, oyster mushrooms, walnuts, and arugula was totally inspired from the recipe in his fabulous cookbook Jerusalem. There are endless combinations of pasta, vegetables, and greens that can work with this garlicky yogurt sauce, feta, and smoky chile walnuts. With its pretty earth-tones, varying textures, and smoky flavors – this is one super-satisfying vegetarian meal. Parfait is French for “perfect.” And this is a perfect little boozy dessert. 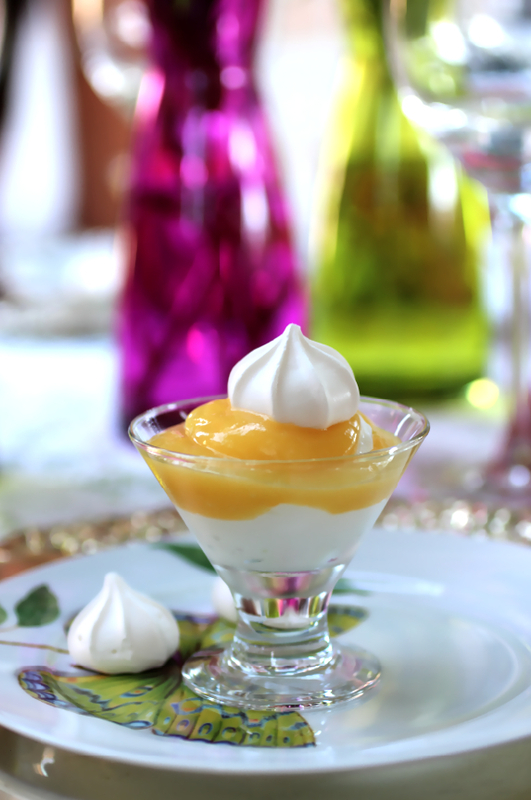 Limoncello is whisked with lemon curd, layered with non-fat Greek yogurt, and served with vanilla meringue cookies. A delightful finale to our recent garden party luncheon. I’m pretty sure this oatmeal is not going to excite all of you. But for those of us who do not put sugar in our coffee, those who would order the egg-white Denver omelette over the blueberry pancakes with maple syrup – my savory friends – this oatmeal is for you! Made with whole grain milled oats (I like The Silver Palate brand) topped with crunchy walnut halves, a generous scoop of non-fat Greek yogurt, a drizzle of high quality olive oil, and a sprinkling of Kosher salt. Super savory, super satisfying. Alas, it is not low in calories, but it is high in many foods that are super-good for the heart (go easy on the salt though). Extra virgin OLIVE OIL, made from the first press of olives, is especially rich in heart-healthy antioxidants called polyphenols, as well as healthy monounsaturated fats. Polyphenols may protect blood vessels. A small handful of WALNUTS a day may lower your cholesterol and reduce inflammation in the arteries of the heart. 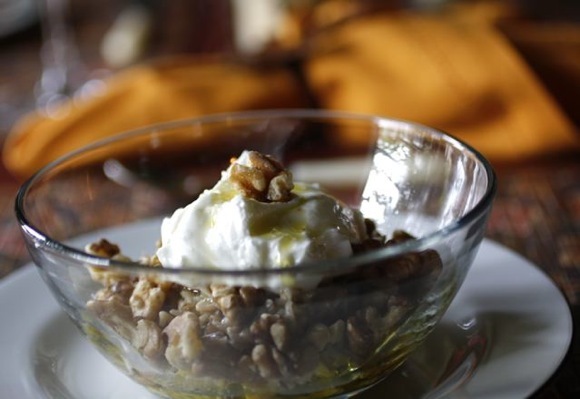 Walnuts are packed with omega-3s, monounsaturated fats, and fiber. Oats in all forms can help your heart by lowering LDL, the bad cholesterol. A warm bowl of OATMEAL fills you up for hours, fights snack attacks, and helps keep blood sugar levels stable over time — making it useful for people with diabetes, too. COFFEE and tea may help protect your heart by warding off type 2 diabetes. KOSHER SALT may be worth a try for people trying to control high blood pressure. It has half the sodium of table salt, thanks to its large crystals. You’ll still need to measure carefully; a teaspoon of Kosher salt has 1,120 milligrams of sodium — not too far below the 1,500-milligram daily limit for people with hypertension. From WebMD: 24 Foods That Can Save Your Heart here. 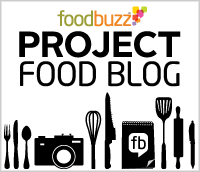 Read all about Project Food Blog here. 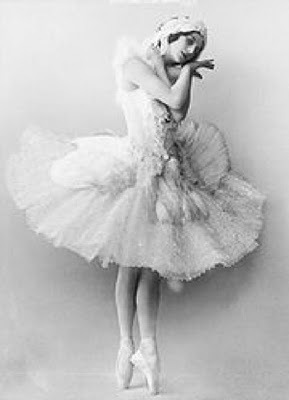 Anna Pavlova (February 12, 1881 – January 23, 1931) was a Russian ballerina of the late 19th and the early 20th century. She is widely regarded as one of the most famous and popular classical ballet dancers in history. Pavlova is most recognized for the creation of the role The Dying Swan. She would become the first ballerina to tour ballet around the world. Inspired by swans that she had seen in public parks and Alfred, Lord Tennyson’s poem “The Dying Swan,” Anna Pavlova asked Michel Fokine to create a solo ballet for her for a 1905 concert. Fokine suggested Saint-Saëns’s cello solo, Le Cygne, as the work’s musical basis and Pavlova agreed. In accordance with old ballet tradition, on the day she was to have next performed, the show went on as scheduled, with a single spotlight circling an empty stage where she would have been. 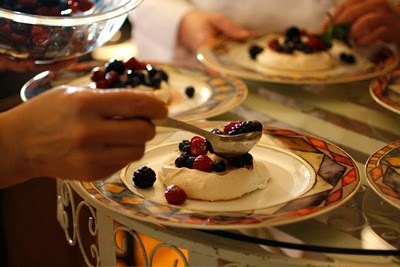 Pavlova is a meringue-based dessert named after Ánna Pávlova. 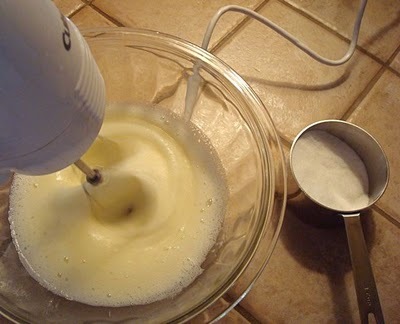 Beat 3 large egg whites with 1/8 t. cream of tartar at medium speed until frothy. Beat in 3/4 c. sugar, one tablespoon at a time. 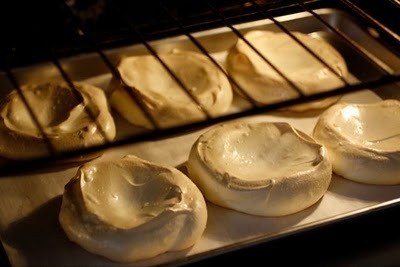 The meringue should be thick and glossy. 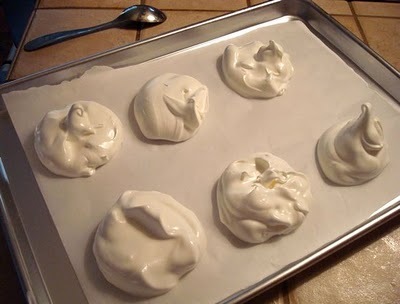 Spoon the meringue onto a baking sheet lined with parchment paper. 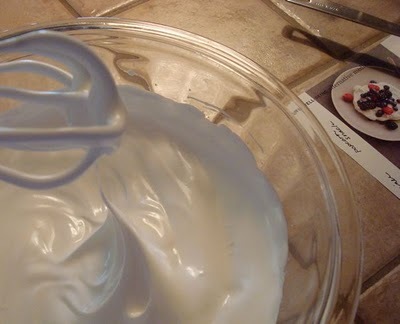 Use the back of a spoon to make wells or indentations in the meringue to hold the yogurt. Bake in a 250° oven for one hour. Then turn off the oven and let cool in the oven for one hour. Combine 1/2 c. sugar with 1/2 c. water in a sauce pan, bring to a boil then remove from heat. 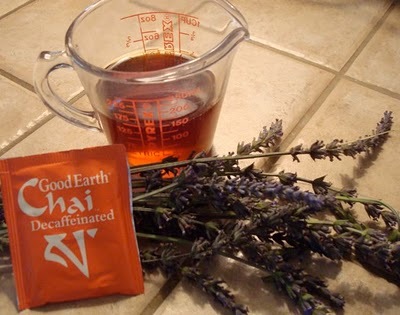 Add a Chai tea bag and 1/4 t. lavender buds. 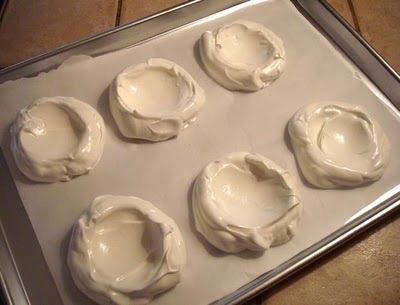 Let stand 10 minutes, then strain into a bowl. Let cool then toss berries in the syrup. 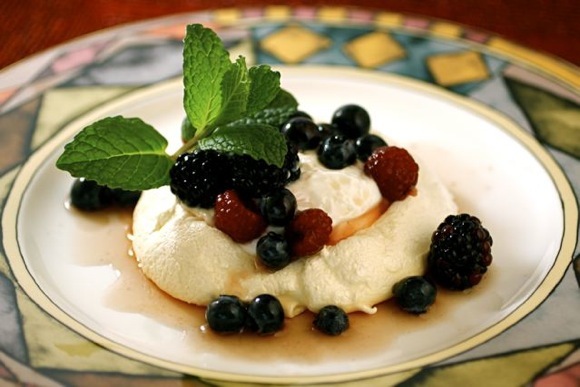 We filled the meringues with non-fat Greek yogurt, then topped with berries, syrup and fresh mint. 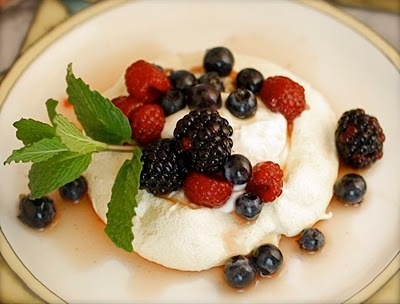 Most pavlovas are topped with whipped cream, but since we used non-fat Greek yogurt, this dessert falls into the heart-healthy category. No fat, no cholesterol, and healthful anti-oxidants in the berries too, it makes a gorgeous wholesome dessert for entertaining. We served this dessert at our Porchetta Party. Light and airy and refreshing, it was a beautiful complement to our dinner. 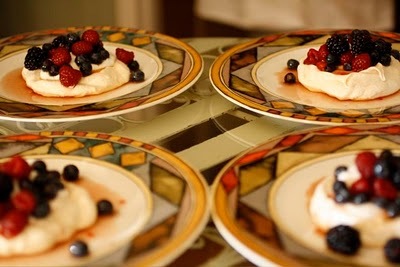 I want to extend a special thank you to my dear friend Chef Allison for preparing the pavlovas. They were absolutely stunning! This delightful recipe was inspired by one in Food & Wine Magazine February 2010 issue, or can be found on-line here.